This 'Tricams' article is part of the e-book - Trad Climbing Basics. Tricams work in a similar way to hexes; they can be placed in 'passive' mode like a nut, and also in 'active' mode. 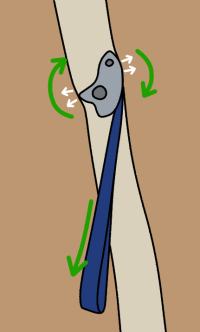 When a tricam is weighted in active mode, the downwards force is transferred outwards to the sides of the crack (white arrows), just the same as a cam. 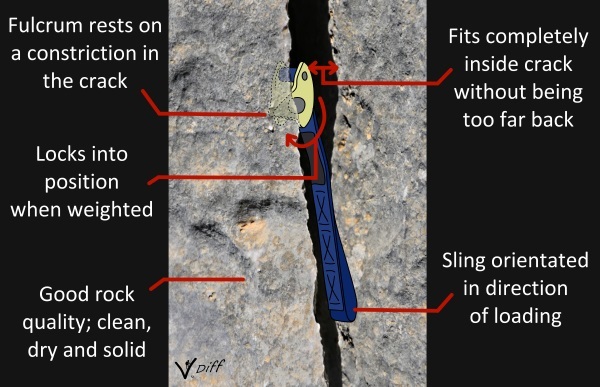 The head rotates (green arrows) and pushes the fulcrum into the rock while the rails do the same against the other side of the crack. Tricams are not as reliable as cams in parallel-sided, vertical cracks, since the fulcrum needs a small dimple or constriction to 'rest' on. Because the fulcrum of a tricam is a sharp point, it bites into soft, wet or icy rock when weighted, making it much better than a cam in these conditions. 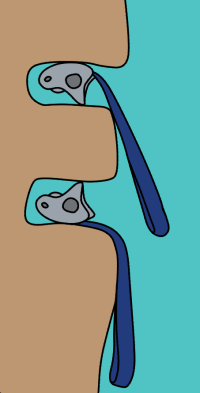 Tricams can be placed in constrictions just the same as a nut.  Because they are generally more tapered than a nut, they will fit better in sharper angled slots. Place them in exactly the same way as you would place nuts. Look for a sharp constriction which gives as much tricam-to-rock surface contact as possible. 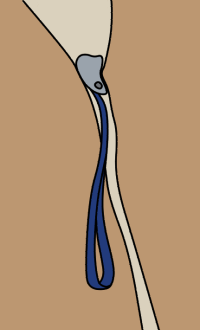 Tricams tend not to wedge in place as well as nuts when used in passive mode. This can cause them to wobble out of position as you climb above. To help prevent this, set them in place with a hard tug just like you would with a nut. 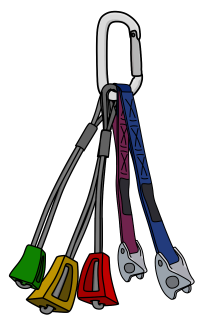 Then extend the placement with a quickdraw or sling instead of using just a single carabiner. 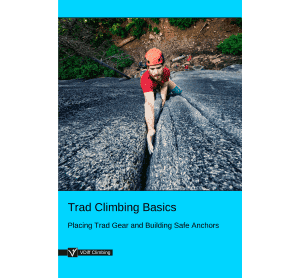 Tricams work beautifully in horizontal cracks or small pockets where cams are too wide to fit properly and nuts would simply slide out when weighted. 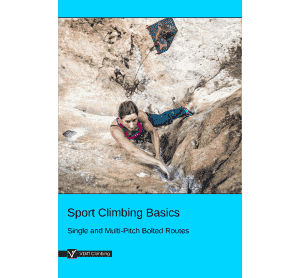 They can also be used in diagonal or vertical cracks that have dimples or constrictions inside. To place a tricam in active mode, flip the head over so that the sling is running through the cam rails. 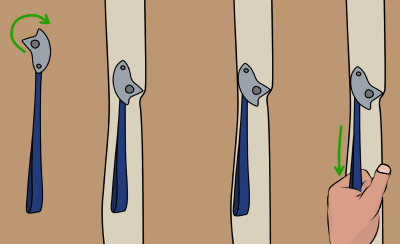 Set the fulcrum in a slight dimple or constriction on one side of the crack. Then set the rails against the opposite wall of the crack. Give it a sharp tug to seat it in position. 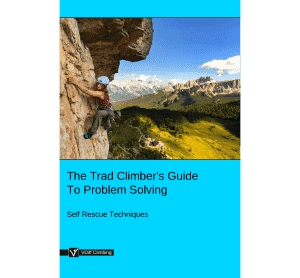 When you pull on the sling, the tricam will rotate and push the fulcrum into the rock while the rails do the same against the other side of the crack. This is the camming, or 'active', action of a tricam. Be careful though, if there's nothing for the fulcrum to rest on or bite into, it'll probably fall out when you climb past. In horizontal cracks, you can place the tricam so the sling comes out from either the top or bottom. 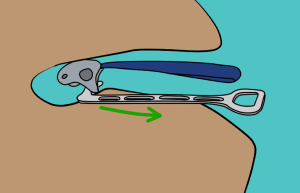 However, you will reduce abrasion on the sling by setting it with the sling on top. Think about how the tricam went in. If it’s in an obvious constriction, shuffle it towards the wider spot to pull it out, just like you would with a nut. You may need to disengage the camming action so it will fit through. Do this by rotating the tricam in the opposite way that you would to seat it. You can use a nut tool for this. Hook the fulcrum with your nut tool, then use the sling to wiggle the tricam out of the crack. Try not to tug on the sling; that can seat the tricam further into the rock, making it even harder to remove. 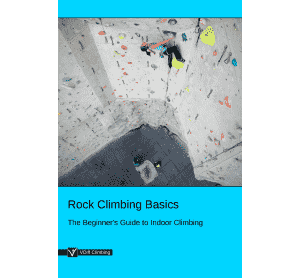 As with hexes, you'll normally only take one or two tricams on a climb. Just clip them on with your large nuts. If you take more, you can rack them in groups of 2-4.